Kendrick Lamar gives his first interview after the release of DAMN. Kendrick Lamar has spoken. In his first interview since the debut of his (soon-to-be) chart-topping cultural phenomenon-of-an-album, DAMN., the rapper sat down for the now-requisite interview with Zane Lowe of Apple's Beats 1 Radio. If, like so much of the general listening public, you have found yourself grappling with the themes and depth of his mystical masterpiece since its release one week ago today, you should find solace in the fact that this is exactly as Lamar intended. "I like to put a lot of different things and wordplays and messages in my music because I want it to live further than two weeks," Lamar told Lowe near the beginning of their 45-minute sit-down. As they touched on everything from Tupac to presidential politics, the conversation offered a compelling glimpse into the mind of a creator whose approach to rap is both intentional and purpose-filled. "I always felt like God used me as a vessel, whether to share my flaws, my intellect, my pain...," he said, making it clear that he views himself as a conduit for a message bigger than him. "[I've] always been a vessel. I can say the nastiest thing on record but I still feel like that's [being] a vessel. You need to hear it. I can't sugarcoat the reality." Lamar explained his differing approach to To Pimp a Butterfly and DAMN., saying, "TPAB [was] the idea of changing the world and how we approach things" while "DAMN. [is] the idea of: 'I can't change the world until I change myself.' So when you listen to records like 'PRIDE.,' 'HUMBLE.,' 'LUST.,' and 'LOVE.,' these are all just human emotions and me looking in the mirror and coming to grips with them." When Lowe began a track-by-track breakdown of the album by asking Lamar to explain the meaning behind the parable he delivers on the spoken intro track, "BLOOD.," the Compton rapper searched for the right way to discuss it without giving the meaning away. "I don't even think I can find the wit to tell you about that record without telling you about that record," he said. "It's a new life." "Is it the beginning of the end or the end of the beginning?" Lowe followed up. "I can't tell you that," Lamar responded. "That's the whole thing." But the rich, layered themes of DAMN. were the prevailing topic. 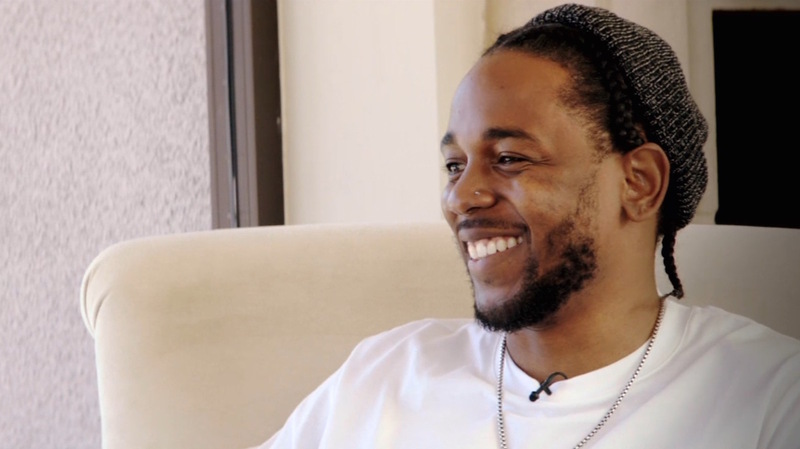 In contrast to the focus on the state of the world heard on Lamar's last proper album, 2015's To Pimp a Butterfly, he talked to Lowe about how he turned that interrogation inward with DAMN. Speaking on the standout song "FEAR.," in which Lamar delves into the genesis of the emotion in his own life, he said: "It's not easy telling your truths and stating your fears from when you were seven, 17 and a couple years ago. But I know at the end of the day, the music is not for me, it's for somebody else." While Lowe didn't ask specifically about the early criticism Lamar received over the first single and video for "HUMBLE.," Lamar admitted he avoids the social media dialogue around his work as much as possible, largely because he knows he's in no position to receive it objectively. "The internet is a tricky place man," he stated. "The way our minds work and the psychological matter; we're only going to see the good things anyway. We're going to block out the negative things."